Welcome to WoodenNameTags.com, the creators of practical, pleasing, and productive wooden name tags. We appreciate our current customers. Our customers are good for us just as we try to be good for them. At this time we are unable to accept new customers because our current customer base is keeping us busy. Do you have faces to which you want to attach names? Would you like to be more ‘friendly’, more ‘approachable’? Are you in a service industry of any kind where you should be identifying yourself for the comfort those around you? Are you wanting a little more ‘green’ in your name tags? Do you or your staff need ‘labels’? 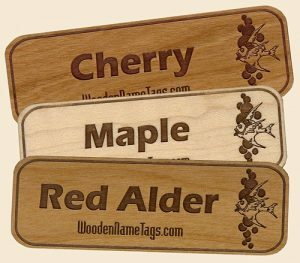 For very little effort and money (usually just $7.45 each) you can have beautiful custom wood name tags created for your firm or organization. Here is how the process typically works: After receiving a wooden tag request we work up a proof, engrave it, and email a scan of the engraved name tag for comment. We make changes until the client is satisfied. We then send a firm quote, receive a list of names from the client, create the wooden name tags, and ship them via USPS Priority Mail. Re-orders are a simple email. We keep designs on file.